A little over a year ago I wrote http://sinaas.blogspot.com/2017/05/asr-nederland-stock-seems-cheap.html since then the share price has increased by 40%. Insurance is outside my circle of competence. ASR Nederland had great results 2017 with relatively few insurance claims, which can vary dramatically per year. SECTOR: [FAIL] ASR is an insurance company and therefore this methodology is not applicable. SALES: [PASS] The investor must select companies of "adequate size". This includes companies with annual sales greater than €260 million. ASR's sales of €3 920 million, based on 2017 sales, pass this test. LONG-TERM DEBT IN RELATION TO NET CURRENT ASSETS: not applicable. LONG-TERM EPS GROWTH: [FAIL] Companies must increase their EPS by at least 30% over a ten-year period and EPS must not have been negative for any year within the last 5 years. Companies with this type of growth tend to be financially secure and have proven themselves over time. ASR does not have a long enough track record as an independent company. The IPO was in 2016. EARNINGS YIELD: [PASS] The Earnings/Price (inverse P/E) %, based on the lesser of the current Earnings Yield or the Yield using average earnings over the last 3 fiscal years, must be "acceptable", which this methodology states is greater than 6,5%. Stocks with higher earnings yields are more defensive by nature. ASR's E/P of 13% (using last years earnings) passes this test. Graham Number value: [PASS] The Price/Book ratio must also be reasonable. That is the Graham number value must be greater than the market price. 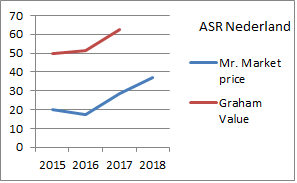 ASR has a Graham number of √(15 x €5 EPS x 1,5 x €35 Book Value) = €62,7 and passes this test.